Bob Boxley lives not too far from me and through the wonders of the internet, this website, and mutual friend Mike Hardesty (www.jeepchasm.com) we found each other. 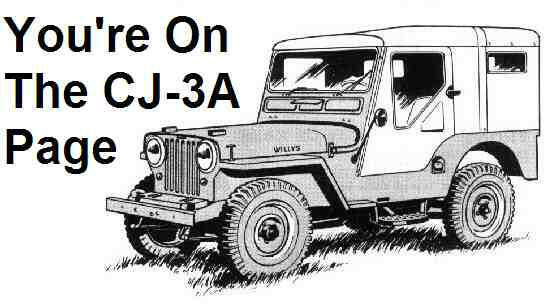 Bob's 1951 CJ-3A belonged to his father and has a special place in his family. This Willys came from the coal mines of West Virginia and had a custom made hoist mounted on outriggers and used the winch to lift pumps. 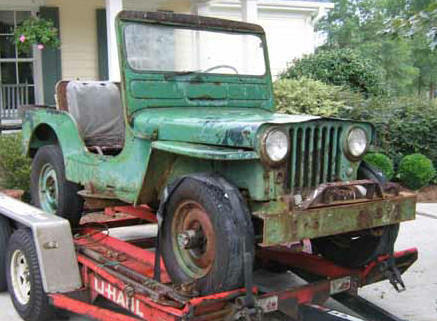 Not too long ago, Bob rescued the Willys from the family farm in Virginia and dragged it North Carolina. With help from Mike Hardesty and myself, we helped Bob get the 3A stripped to the bare frame. This is where the project starts on my end. Follow along as Bob's Willys is given a new lease on life and will surely turn heads on the beaches of North Carolina this summer! For more in-depth restoration tips, please see My Restoration, or the Tech Tips section. Check back often as this page will be updated frequently! I am keeping a log of the restoration process here: Bob Boxley's Restoration Log. "My Boy" Poses for the Camera New!